According to report from Telegraph, Manchester City are becoming increasingly confident on the prospect of landing Arsenal ace Alexis Sanchez to the Etihad stadium by January. Manchester City had previously made a move for the winger in summer which failed to materialize because Arsenal accepted the offer on the condition of replacing him with Thomas Lemar of Monaco or Julian Draxler of Paris Saint German but the gunners failed to secure a move for both players. 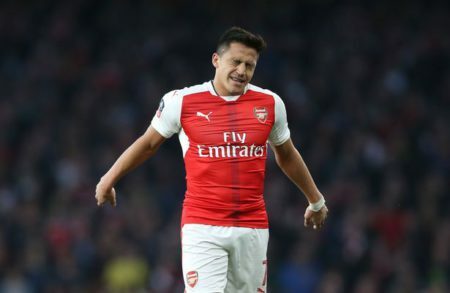 Sanchez who is in the final year of his contract at Arsenal has refused to renew his contract as he is reportedly ready to bid farewell to the North London side in other to reunite with his former manager, Pep Guardiola at Manchester city. The Chilean is free to accept pre-contract agreements with other clubs as from January and Arsenal could risk losing him for free at the end of the season should they fail to sell him during the January transfer window. Top European clubs like PSG, Ac Milan and Manchester United are reportedly on the lookout for the 28-year-old who has scored once and assisted twice in all competitions for Arsenal this season. It is believed that Manchester City could be offering less than the initial £60 million they offered in the summer since they can as well get him for free at the end of the season with Arsenal carefully considering other transfer options such as a swap deal with PSG for Draxler.